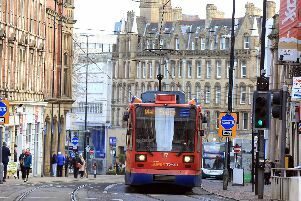 A victory has been secured in the fight against graffiti blighting Sheffield, after a telecommunications giant cleaned up tags scrawled across its equipment. Roadside cabinets belonging to Openreach, which is responsible for Britain's largest phone and broadband network, have become a popular targets for spray can vandals around the city. But the company agreed to paint over their unsightly work, in an effort to smarten up Sheffield's streets, following pressure from councillors and Sheffield Heeley MP Louise Haigh. The Labour MP teamed up with party colleagues on the Park and Arbourthorne ward to demand action from Openreach and Virgin Media, which also owns telecommunications cabinets in the city. Openreach responded that it was arranging for those cabinets which had been targeted to be re-painted, but the Labour group said Virgin Media has yet to provide such a guarantee. Councillor Ben Miskell said: "I am delighted that BT Openreach has dealt with this problem and that we were able to ensure this without needing to use formal legal action – which would have slowed down the process. "As a result of our efforts hundreds of telecoms cabinets across Arbourthorne, Norfolk Park, Gleadless Common and Heeley Green are being re-painted and cleared of graffiti. "Conversations are still ongoing with Virgin Media to ensure that they too take responsibility for any of their cabinets which are blighting our streets – and we will not be deterred in ensuring that they do so." Responding to the group's complaints, Openreach said street furniture was a 'soft target' for graffiti vandals and although the company took action to clean up their handiwork, new tags would often appear soon after the old ones were covered up. An Openreach spokesman said: "Following the reports of graffiti on some of our roadside cabinets in the Park and Arbourthorne ward, Sheffield, we launched a clean-up campaign. "We’re also really grateful to the politicians for taking the time to contact us, and everyone at Openreach shares their frustration with our equipment being damaged in this way. "Anybody who would like to report damage to Openreach equipment can get in touch with us at openreach.co.uk"